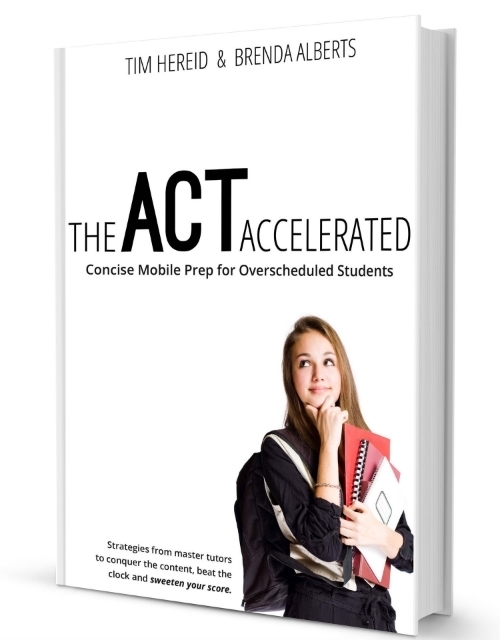 We are excited to announce our new concise mobile ACT guide for overscheduled students: The ACT Accelerated. Packed with over 50 videos, diagrams, practice questions and strategies, Brenda Alberts and Tim Hereid have written an unparalleled guide to the ACT exam, the most important college entrance exam today. For the past decade, Alberts Tutoring has used a proprietary mix of test strategies yielding extraordinary results for hundreds of high-achieving students. Our exclusive specialization in ACT Prep, our hand-selected group of elite tutors, and our commitment to providing individualized curricula are the keys to our success. In a college admissions climate where a high GPA is more a prerequisite than an achievement, Alberts Tutoring provides ACT Prep prizing deep content knowledge and results-driven strategies. A good ACT score factors heavily into a school's consideration of prospective students. Our unique ACT prep curriculum provides our students with the extra edge they need to rise above the competition.